Affiliate Links: If you click a link I may make a small commission. Happy Tuesday! It totally feels like Monday today and I’ll be honest and say this weekend, though long, was not long enough. We spent most of our time trying to catch up on things around the house and prepare for the end of our major renovations. Can you believe we’re only now coming to the end of that? I hope you were able to have a fun and relaxing weekend! A couple of months ago, I actually won a gift card from ZebraClub.com after they launched their Instagram. Zebra Club is a Seattle Boutique, and ZebraClub.com is their exclusive online boutique, selling unique items that aren’t available in their brick and mortar storefront. They’ve hosted a few pop-ups for their spring line, and they asked if I’d be interested in sharing the love with you for ZebraClub.com by providing a gift card giveaway! Of course I said yes, so get yourself entered below and check out the pretty spring dresses! This gift card would make a nice dent in picking one of these up for the coming summer months! How did you spend Memorial Day Weekend? What is your favorite item from ZebraClub.com? The Pink Chicken short Allegra dress is super cute! Thanks Olya! Love that dress too! I’m loving the two dresses on the right of your collage (Ace & Jig Shore dress & Whit Dress in floral print). I totally live in jeans or white jeans with v-necks and sandals or sneakers on the weekends. So easy and comfy, but still cute! Totally agreed Mattie! Thanks for entering! That scarf is so cute! I love this comfortable looking outfit. I’m all about comfort lately. I love their Pepin Tie Dye Tassel Dress in Navy, it’s so cute! I love all of these fabrics and styles. I would love any of their things. I thing one of my favorites is the Conditions Apply Right From Here Tunic Romper. Thanks for the opportunity. I really love the LAUREN MOFFATT LIPPI LONG SLEEVE DRESS. Love that too – thanks for entering, Danielle! love that scarf. the wren kissing kimono dress would be a great beach outfit. thanks! Thanks so much for entering, Ashley! You’re so cute! Love that scarf! Lovin the Pepin Olive Silk Shorts – too cute for summer! Thanks so much for entering, Leah! I like the Clu Laced Cardigan With Zipper. Thanks so much for entering, Susannah! Isn’t that pretty? Thanks for entering, Kim! Cute outfit! It’s comfortable and casual without being sloppy! 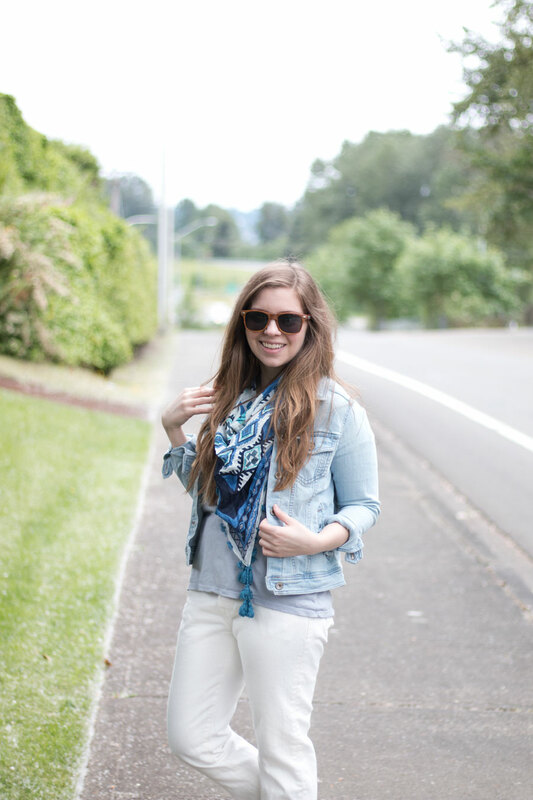 The scarf is fun and I love the jean jacket; I’ve been looking for one! I love the Pepin Tie Dye V Neck Tee in Apricot! Thanks so much for entering, Kelly! I love this casual look – I’ve been looking for a jean jacket similar to yours and never even thought to check out Kohl’s. Also digging those Chanel-esque espadrilles. Did you find they ran true to size? I hadn’t either until I found this one on clearance last year. I think I paid about $7! So crazy. I’d say they run a little tight, I ordered a 6.5 which is my normal size but had to wear them a few times before I found them comfortable. Hope that helps! I love your scarf and sunglasses :) And I love Zebraclub, too! I have looked at those Target Espadrilles every single time I’m there (so like every day) but haven’t convinced myself to buy them. Your post and adorable outfit might have. Haha, they’re pretty great, though mine are starting to fall apart. That’s the only problem with inexpensive shoes that get worn a lot! Hope you grab ’em before they’re gone! My favorite is the Wren Floral Print Cami Dress Thanks for the giveaway! Of course, thanks for enteirng, Guada! Loving the color and the pattern of the ONLY HEARTS THISTLE AND ROSE FLARE MID CALF SKIRT. GORGEOUS! Great pick, Alina! Thanks for entering! The Whit Moss Dress in Painted Grid is my favorite. Very pretty dress. Great pick, Sean! Thanks for entering! I love the MKT Studio FOOTY Scarf! Loving the leopard print and black & white striped coat. That would definitely be a conversation piece to wear this Fall! I love being cute and comfy as well. I didn’t realize Zebra club was a Washington created brand. Love your shoes, they’re so great for warm summer days! Love love love your scarf! That is the perfect comfy-casual look. Thanks for sharing! I am obsessed with your scarf! Also, I’m super intrigued by Everlane now! Everlane is great if you’re in need of basics! They have some really cute styles (I’m a fan of the u-neck tops!) and they’re always introducing new pieces. i love this look. Definitely something I would wear. I absolutely adore this look! So casual and effortless! Thanks so much, Lauren Ashley! Super cute outfit. Love the scarf. Love that one too – I own it in blue and red and it’s great! Thanks for entering, Natalie! Love your outfit! 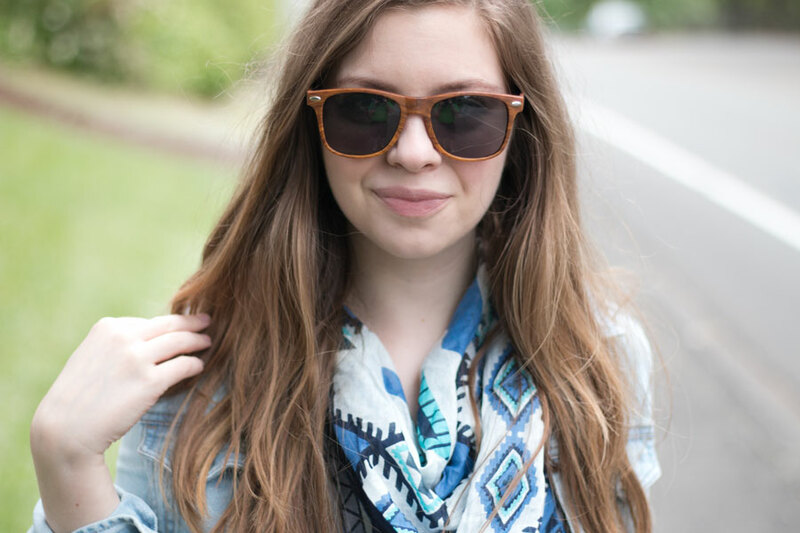 The scarf is PERFECT for the spring and summer, too! Love this look and also the scarf. I like how everything came together. Your outfit is so cute! And so are the things for the giveaway! This is a great post! Love your outfit! And thanks for such a fun giveaway!! Thanks Rosemond, and thanks for entering! I’m really loving their designs – I wouldn’t even be able to choose one because they are all so equally pretty! These pics are awesome – what kind of cam do you use? You look adorable! Thank you for the giveaway! I love the Wren Combo Shift Dress. Thanks so much for entering, Samantha! Great outfit. Love the simple white pants! Super cute giveaway! Thanks for sharing! Loving the mosaic romper… why is it sold out?! Wah. love the Pink Chicken Laurel top! I like the Wren Overall Dress – would be great for casual days in the summer. Such a cute and comfortable outfit! I really love this look for summer. The LAUREN MOFFATT LIPPI LONG SLEEVE DRESS. I love how your shoes are casual, but the black toe makes them look classy at the same time :) And, those sunglasses are super cute!